• The financial institution leads the mobile payment sector in Spain, with a 40.8% market share and more than a million cards paired to a terminal. • A total of 4% of all CaixaBank's card transactions are now made via mobile phones and wearable devices. 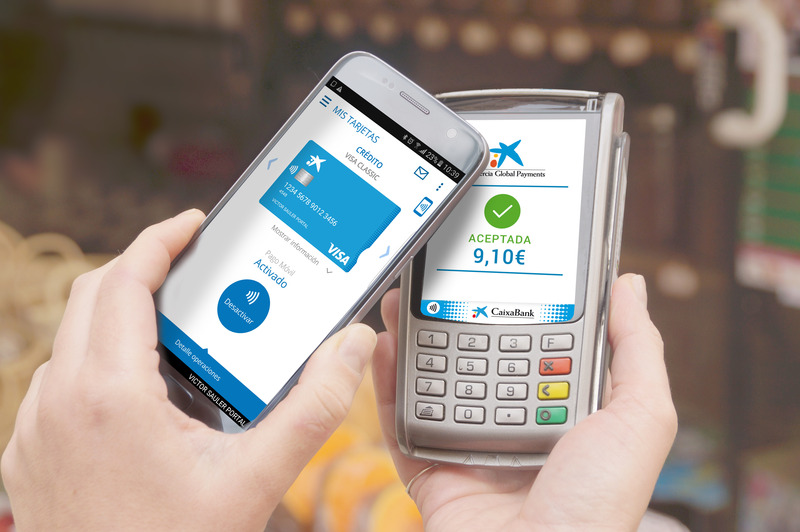 • CaixaBank has its own payment application, CaixaBank Pay, with access to a wide range of card management services, and which is integrated with Samsung Pay and Apple Pay. CaixaBank, Spain’s leading bank in terms of payment methods, has recorded 30 million purchases by phone made by its customers in stores during 2018. The figure implies an eightfold increase in phone payment data on the previous year, when 3.7 million transactions were made with this system. Throughout 2018, the volume of purchases made using CaixaBank mobile payment amounted to 885 million euros. As regards the number of users, nearly 750,000 customers have paired their cards to a phone to make purchases. The total number of CaixaBank “enlisted” cards now exceeds one million (110% up on last year). These figures confirm the launch of the mobile phone as a habitual payment method for CaixaBank customers. In fact, with respect to the total number of transactions carried out with CaixaBank's cards in physical stores, which throughout 2018 amounted to 1,387 million (14.2% up on 2017), the percentage of mobile payments now stands at 4%. Similarly, the figures establish CaixaBank as the leader in the mobile payment sector in Spain, with an estimated 40.8% market share, in accordance with transactions made in December 2018. Internationally, CaixaBank is a pioneer when it comes to launching mobile payment. The company has its own application, CaixaBank Pay, which enables users to make purchases and access a wide range of card management services. This solution is integrated with Samsung Pay and Apple Pay on wearable phones and devices that are compatible with these services. Similarly, the bank has launched a mobile payment service for smartwatch models that use Garmin Pay or Fitbit Pay. For Juan Antonio Alcaraz, CaixaBank's Chief Business Officer, the bank's strong growth in mobile payment is directly related to the service's good user experience, whichever device the customer uses: “The alliance with big technology companies, such as Samsung and Apple, and our work alongside them enables us to integrate into the phone both the payment solutions and a comprehensive offer of options for card management. Therefore, in addition to growing in mobile payment transactions, we have also notably increased the interaction of our customers using the CaixaBank Pay application and through access to the various services, such as enabling or blocking the card, increasing its limit, payment fractioning and money transfers, among others”. The bank's mobile payment customers have access to all the card services we offer, including the CaixaBankProtect guarantee, which protects the user against any unauthorised use of its payment methods. CaixaBank is Spain's leading bank in terms of payment methods, with a total of 16.8 million cards issued and market shares of 23.7% in purchasing turnover and 28% in turnover via POS terminals in stores. CaixaBank's business model relies heavily on technology and digitisation, and in addition to its leadership in mobile payment and card payment, it also leads digital customers in Spain, with 6.1 million customers among its online banking and mobile banking services. As a result of this strategy, CaixaBank has established itself among the best valued banks in the world due to the quality of its digital services and its commitment to digital transformation. In 2018, the bank was named “Best Digital Bank in Western Europe” by the specialised publications Euromoney and Global Finance. Similarly, CaixaBank's mobile banking application has been recognised by the Bank Administration Institute (BAI) and British magazine The Banker, which chose it as the best technology project of 2018 in the ‘mobile’ category.